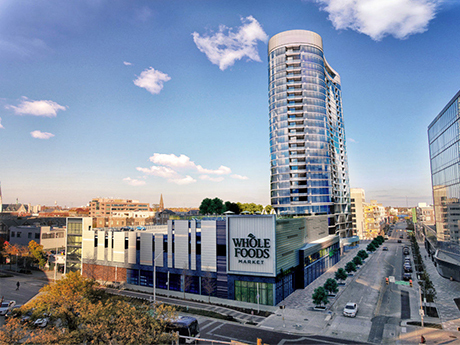 The $121 million 360 Market Square is a mixed-use development in downtown Indianapolis featuring 292 luxury apartment units and a Whole Foods Market. Flaherty & Collins was the project developer. If you happen to read or listen to Freddie Mac officials, the key economic factor driving housing demand is the labor market. In 2017, the Indiana Economic Development Corp. (IEDC) secured 293 commitments from companies across the country to locate or grow in Indiana. Collectively, this will make for more than $7 billion in new investments and 30,158 new jobs in the coming years, marking the highest annual commitment in IEDC history. Companies currently expanding and adding thousands of jobs throughout the region have been contributing greatly to the growth of the multihousing market in central Indiana. More than 2,380 market-rate apartment units were completed in 2017. Construction doesn’t appear to be slowing down either, as over 2,200 units were under construction at the beginning of 2018. Central Indiana has experienced a marked increase in overall multifamily deliveries. Between 2014 and 2017, developers delivered approximately 15,000 new units, compared with 13,500 units over the previous 14 years combined. A large majority of the projects are greater than 100 units, particularly the market-rate developments. Lately, most of these projects have contained pockets of amenities or are located near amenities. Downtown Indianapolis was home to one of the more iconic projects completed in 2017. Indianapolis-based developer Flaherty & Collins delivered 360 Market Square, a $121 million mixed-use development consisting of 292 luxury apartment units and a new Whole Foods Market. Located adjacent to Cummins’ new $30 million global distribution headquarters and the new Julia M. Carson Transit Center, 360 Market Square enables residents to take full advantage of its accessibility to various downtown attractions. Virtually down the block, the largest project under construction in terms of number of units is Phase II of The Residences at CityWay. The $135 million mixed-use development is expected to add 400 units to downtown Indianapolis once it is completed in 2019. The suburbs are not holding back either, particularly the trifecta of Brownsburg, Avon and Plainfield, which have been holding their own against the hotbed communities of Carmel and Fishers to the north. Both areas have seen several new developments of 100-plus units in the past few years. While the west side will benefit from several new deliveries in 2018, it lacks the planned projects we are seeing take shape on the north side. According to Reis and Axiometrics, the multifamily sector in central Indiana has maintained sound real estate fundamentals during this expansionary period. Although rent growth is slowing and the vacancy rate will likely rise 10 to 15 basis points due to a surge in new supply, the most in 20 years, the market still offers plenty of opportunity for investors. The key is to ensure that any future development is carried out prudently. Indianapolis is fortunate to have investment fighting its way into our neighborhoods. As a community, we should all make sure the investments on the table will feed our community and its residents for years to come, and not provide a broken development to detract from the hard work of central Indiana. Will we see developers pivot to smaller infill concepts and launch those into our new urban-suburban trend? With a Class A average vacancy rate of 5.9 percent in the fourth quarter of 2017, and Class A asking rent increases through all four quarters of the year, we see opportunity in the market. Yes, it rhymes, but that is not our fault. Some have noticed the new trend toward urban core development, even in nontraditional urban development areas. Going vertical in Carmel, Fishers or Greenwood with multifamily or mixed-use development was unheard of 10 years ago. It seems like most new multifamily housing has some mixed-use component, or the ability to leverage existing area amenities. With new development working its way through existing Tier 1 sites (both urban and suburban), what alternative can there be to keep up with the demand for quality Class A space? The answer may be smaller infill developments, less than 100 units. Indianapolis and its resident energetic and entrepreneurial developers, albeit somewhat unknown, seem to be taking note. In the Broad Ripple Village neighborhood, there are five new developments in various stages of construction that range between 35 and 151 apartment units per project. For one of our top market makers to take on a project, it may need to be in the 150- to 250-unit range with 20,000 square feet of associated retail and office. But smaller multifamily developers should seize on the opportunity to develop near big projects and capture tenants. This new urban infill opens up many opportunities for apartment developers throughout the region. With more than 30,000 new jobs planned for the region, look for other neighborhoods throughout central Indiana to attract new multi-housing developments in the near future. The limited availability of land and sites adjacent to the new suburban-urban core should allow for smaller projects with more variability in design, materials, and layout to penetrate central Indiana. Now that the grid has been laid out in Indianapolis, we can all help finish the picture. — By Jonathan Hardy, Advisor, and Steven Heatherly, Senior Market Research Analyst, Bradley Co. This article first appeared in the March 2018 issue of Heartland Real Estate Business magazine.